Author(s): Thierry Naas, Service de Bactériologie- Hygiène, Hôpital de Bicêtre, APHP, EA7361, Faculté de Médecine Paris- Sud, LabEx LERMIT, Le Kremlin-Bicêtre, France. Laurent Dortet, Bogdan I. Iorga. The fight against infectious diseases is probably one of the greatest public health challenges faced by our society, especially with the emergence of carbapenem-resistant gram-negatives that are in some cases pan-drug resistant. Currently, β-lactamase-mediated resistance does not spare even the newest and most powerful β-lactams (carbapenems), whose activity is challenged by carbapenemases. The worldwide dissemination of carbapenemases in gram-negative organisms threatens to take medicine back into the pre-antibiotic era since the mortality associated with infections caused by these “superbugs” is very high, due to limited treatment options. Clinically-relevant carbapenemases belong either to metallo-β- lactamases (MBLs) of Ambler class B or to serine-β-lactamases (SBLs) of Ambler class A and D enzymes. Class A carbapenemases may be chromosomally-encoded (SME, NmcA, SFC-1, BIC-1, PenA, FPH-1, SHV-38), plasmid-encoded (KPC, GES, FRI-1) or both (IMI). The plasmid-encoded enzymes are often associated with mobile elements responsible for their mobilization. These enzymes, even though weakly related in terms of sequence identities, share structural features and a common mechanism of action. They variably hydrolyse penicillins, cephalosporins, monobactams, carbapenems, and are inhibited by clavulanate and tazobactam. Three-dimensional structures of class A carbapenemases, in the apo form or in complex with substrates/inhibitors, together with site-directed mutagenesis studies, provide essential input for identifying the structural factors and subtle conformational changes that influence the hydrolytic profile and inhibition of these enzymes. Overall, these data represent the building blocks for understanding the structure-function relationships that define the phenotypes of class A carbapenemases and can guide the design of new molecules of therapeutic interest. Keywords: Biochemical properties, carbapenemase, class A, crystallography, molecular modeling, mutagenesis. Affiliation:Service de Bactériologie- Hygiène, Hôpital de Bicêtre, APHP, EA7361, Faculté de Médecine Paris- Sud, LabEx LERMIT, Le Kremlin-Bicêtre, France. Keywords:Biochemical properties, carbapenemase, class A, crystallography, molecular modeling, mutagenesis. Abstract:The fight against infectious diseases is probably one of the greatest public health challenges faced by our society, especially with the emergence of carbapenem-resistant gram-negatives that are in some cases pan-drug resistant. Currently, β-lactamase-mediated resistance does not spare even the newest and most powerful β-lactams (carbapenems), whose activity is challenged by carbapenemases. The worldwide dissemination of carbapenemases in gram-negative organisms threatens to take medicine back into the pre-antibiotic era since the mortality associated with infections caused by these “superbugs” is very high, due to limited treatment options. Clinically-relevant carbapenemases belong either to metallo-β- lactamases (MBLs) of Ambler class B or to serine-β-lactamases (SBLs) of Ambler class A and D enzymes. Class A carbapenemases may be chromosomally-encoded (SME, NmcA, SFC-1, BIC-1, PenA, FPH-1, SHV-38), plasmid-encoded (KPC, GES, FRI-1) or both (IMI). The plasmid-encoded enzymes are often associated with mobile elements responsible for their mobilization. These enzymes, even though weakly related in terms of sequence identities, share structural features and a common mechanism of action. They variably hydrolyse penicillins, cephalosporins, monobactams, carbapenems, and are inhibited by clavulanate and tazobactam. Three-dimensional structures of class A carbapenemases, in the apo form or in complex with substrates/inhibitors, together with site-directed mutagenesis studies, provide essential input for identifying the structural factors and subtle conformational changes that influence the hydrolytic profile and inhibition of these enzymes. 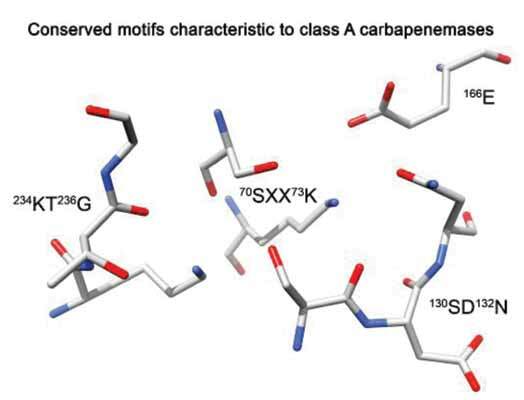 Overall, these data represent the building blocks for understanding the structure-function relationships that define the phenotypes of class A carbapenemases and can guide the design of new molecules of therapeutic interest.